She shows a depth of gratitude to the people who read her books and still says she counts herself lucky that people will read her books. If it was me, I tell you, CNN is too small to tell the world about myself. But this is not about me. 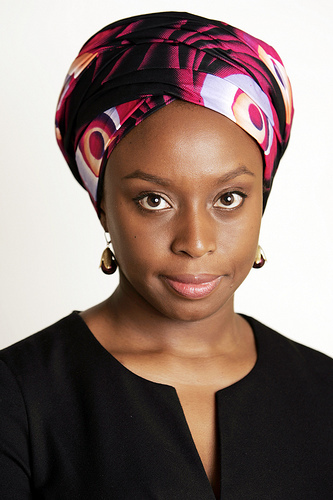 It is about Chimamanda Ngozi Adichie, an author I have the highest regard and admiration for. I have newspaper cuttings of her from 2008 when she won the Orange Prize. It is on my dream board alongside that of Christine Amanpour of CNN. The first woman I ever saw reporting from a war zone as a child during the first Iraq (Gulf) war. How many of you remember those khaki shirts and combat trousers? That’s right. That’s the great Ms Amanpour. Subconsciously, I would like to say she is one of the reasons I admired journalism before I ever thought of becoming one. I always wanted to be a criminal lawyer; you know getting the bad guys. But I changed my mind as I believe in the power of words more than I do in the justice system of the world in the 21st century. But there is still hope. All men will get what they deserve at the right time, dead or alive. History has been known to do justice to a whole lot of folks and things around us. Back to Miss Adichie, at the event, she said she is doing what she loves to do. She loves writing and it what she has always wanted to do. It soon dawned on me that she does not say things to score points with people. She says what she believes she needs to say. At 32, that is one heck of a staunch confidence and I throw my hat off to her in salute. This is where she had me rooting for her all over again though I already like her books and think she is one author Nigeria as a nation will one day acknowledge for reminding us about a part of our history we are so happy and eager to forget, the ‘Biafra War’. For crying out loud, there are a lot of people my age, who have no idea what the war was about but they can tell you about the latest music and fashion trends. Yet, they have no knowledge of their history. She said she is a firm believe that Africa’s history should be written by Africans. I could not agree more. For so long our history has been distorted by some lunatic who only spent two weeks in Africa and all of a sudden, they are African experts. I won’t mention names but you all know who you are. This is not to take away from great historians and writers who have written about Africa but Africa has great stories that needs to be told, yet no one is telling it like we would like it told. Hence, let’s start telling our own stories after all, we have the unadulterated copyright to it. It is all around us, our parents know them and so do our grandparents. When was the last time you sat at the feet of an elder to hear an oral story? We need to go back to those fun times and learn about King Ododuwa, the great Jaja of Opobo, Oba Ovorame Nogbasi, who was exiled and deported to Calabar from the Ancient Benin Kingdom when the Europeans came to Benin or should I say when they tried to take over and he was having none of it. That’s right, never mess with a Benin man, he will cut you up. She is not afraid or reserved about the truth. I mean how many authors will you hear say, Nigeria’s history is fractured? Well, with the exception of Wole Soyinka and Chinua Achebe. Or tell you straight up that she is not interested in telling propaganda stories and does believe that it is the work of fiction to be objective. But I think this is where I have the utmost level of respect for her. Reading her books, I have noticed she does not shy away from calling her characters some strong Igbo names, you know the type you pull yourself together before saying a word. Some sentences/lines are even written in Igbo. For me, that’s a woman who is proud of her heritage. For someone who started writing at such a young age and thought writing about white folks was the way but soon changed her mind after reading ‘Things Fall Apart’ by one of Nigeria’s best authors, Chinua Achebe. It is cool to write about Africans and tell African stories. ‘Purple Hibiscus’ was a very moving story on different levels, ‘Half Of A Yellow Sun’ was a multi-layered book full of history and ‘The Thing around Your Neck’ is a collection of short stories which again depict Nigeria and Nigerians at their best and at their worst. But the humour is great. Once again, Adichie reminds us every now and again about the place where her writing started, the university of Nsukka. It is a place that features in her work. I think that is what heritage does to you. When you know who you are and you are proud of your roots, then the stories that come out of you reflect that you know who you are better than the world who tries to define you with a few boxes asking if you are Black British or Black African. I remember being at University and reading books by Africa-American authors but had a university acquaintance who read books by British and other European authors. I used to think I was missing out on something and that it was un-cool to read books by African and African-American authors. So, I went out and bought books by Diane Atkinson among others. Please, don’t get me wrong, she is a great author and I respect her for her body of work. That was my secret but not anymore because these days, most of the books I read are by African authors. I’m hungry for their books and I have promised myself that for the next two to three years, that’s all I am going to do. That’s not to say I won’t read books by writers from the West or from others parts of the world. On my books to read list are plays by Tennessee Williams, ‘A Street Car Named Desire’ is at the very top that list. In fact it is starring at me as I type away. Then there are some fine books by authors like Elizabeth Noble, ‘Things I want My Daughters To Know,’ Elizabeth Gilbert has a new book coming in August and after ‘Eat, Pray Love,’ you must really hate reading to miss her books. For the books, the good stories, the humility and the good sense of humour, thank you Miss Adichie and for being a proud Nigerian/African writer. Keep them rolling because we are going to keep reading them. This entry was posted on Wednesday, December 16th, 2009 at 11:11 am	and is filed under Africa, Book Reviews, Journalism. You can follow any responses to this entry through the RSS 2.0 feed. You can leave a response, or trackback from your own site. I’m with you in your admiration for Chimamanda. She is a huge inspiration to me, personally and professionally. It was around the time I was toying with quitting my job to become a full time writer, that she was nominated for the Orange Prize. That made me sit up and take notice! I thought, “If a young Nigerian lady can do it, so can I” and from then on, I have had the courage to pursue my dreams. I also feel you on reading book by other African writers. Thankfully, our stories are now being written by us, and our books are now being published by African publishers. I have five new books on my shelf right now written by Africans and I can’t wait to start reading them. We still have a long way to go, but I’m confident that soon, we will challenge the Western stereotypes of Africa with our own version of our stories. I share the same level of admiration for Ms Adichie. I first heard about her in 2004 or 2005 thereabouts when her book was being read on BBC’s off the shelf series. It must have been the reader who first attracted me to listen to the candidly crafted piece of narrative, but to me Purple hibiscus and Ms. Adichie became instant favourites and I have read all her works ever since. I will never forget when she came to launch Half of a Yellow sun at our capital, Nairobi. My high regard for her heightened. I wish to become a writer and film maker. i am working towards it, and i thank you for contributing to the development of african literature in your own way. Make sure you comment after reading Ngugi’s books. He is the “father” of Kenyan literature, dare I say. Hey Felix, thanks for stopping by and taking the time to read the post and for your input. For sure, will comment about Ngugi. Thanks for stopping by Ngum. I am sure you will enjoy her next book, Americanah.